The Centennial Hall in Wroclaw is a multi-purpose recreational building that is a landmark in the history of reinforced concrete architecture. It was built in 20 months during the years 1911-1913, when the city (then named Breslau) was part of Germany. The Hall had the largest dome of the world of its time, with a diameter of 65 meter (50% larger than the size of the Pantheon). The use of steel and concrete for such a large construction was considered both revolutionary and daring, and officials and workers were concerned for safety issues. The Hall was built to the plans of Max Berg. 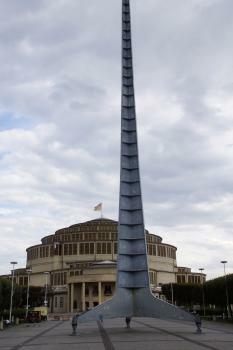 An important city like Wroclaw felt the need to have a prestigious location to hold exhibitions and fairs. So the Centennial Hall was built to commemorate the 100th anniversary of victory over Napoleon in the Liberation Wars of 1813-15. The core area also includes the exhibition grounds of Wroclaw, and therefore (like the Royal Exhibition Building in Melbourne) is an outstanding example of modern recreational architecture. Like a modern day stadium, the Centennial Hall was used by all who aimed to attract large audiences: from Adolf Hitler to Marlene Dietrich to Pope John Paul II. 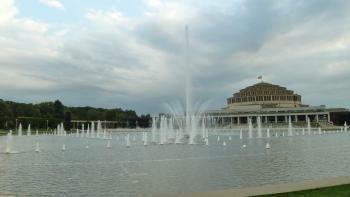 It still functions as a concert hall and sports arena. I felt a bit awkward at first to visit a site like this, but its historic and architectural value is recognized by more than WH spotters alone. For an entrance fee of 7 zloty you're allowed to have a look around and watch a video. I was joined by several groups of elderly German tourists, probably on a tour of remembrance in this former German town. The core zone of the WHS also includes the exhibition grounds around the Hall. There's a square leading up to the hall that is modelled after a classical forum. A nice place to sit and relax for awhile. There's the Four Dome Pavillion too, like mini-versions of the dome of the Hall itself. The large concrete pergola that surrounds a pond at the moment is in the process of being restored. 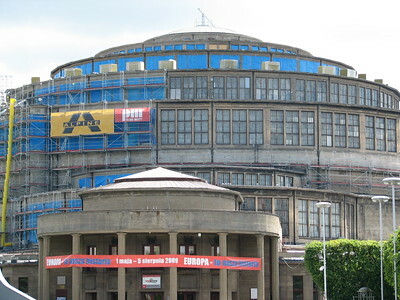 It has been reported that the workers were so scared by the revolutionary construction technique of this building that they refused to remove the casing of the concrete pillars, they feared that the huge dome would collapse. I'm not sure if this is true, at least it's a good story. The fact is that the dome has a diameter of 65 metres, it was the largest domed building in the world at the time of construction. But the Centennial Hall was also aesthetically a novelty: plain and simple forms, no cladding and only a minimum of decorative elements, a turning away from Historicism and a move towards the principle of “form follows function”. It is still the venue for various events, so undoubtedly a successful construction. But for today's visitors, the Centennial Hall is no longer monumental and overwhelming or even frightening, and though I have a fondness for modern architecture I'm also not very enthusiastic about the look of the building. Nevertheless it is a milestone of modern architecture and was trend-setting for the use of a new material: reinforced concrete. Therefore, it deserves the place on the WH list. The surrounding is quite nice, I liked the grounds around the artificial pond and the water features, the winding colonnades with hundreds of columns and the Four-Dome Pavilion. It is a harmonious ensemble, only the Iglica monument is a bit annoying (photo), a hundred metres high needle which impairs the view to the main entrance of the Centennial Hall. It is worth to visit the interior, because the construction technique can not be seen from the outside. It is a ribbed structure (see the photo in the review by Els), the ribs are supported by a lower tension ring and connected by an upper compression ring. The whole structure is stabilized at three levels by stiffening rings on the circumference of the dome. Wroclaw is a beautiful city, hardly inferior to the better-known tourist destination Krakow. However we spent only one and a half days and one night there, but seven days in Krakow, so that a comparison might be unfair. A big plus for Wroclaw is the Oder river and the river islands, the river plays a pivotal role in the historic city centre, a feature that is missing in Krakow. Also worth seeing are the beautiful Market Square, the Aula Leopoldina, and the Cyclorama 'Battle of Rac³awice'. We would have loved to stay longer. Gnomes, domes and Mocne Piwo was the theme I texted to my friend as I boarded the plane, and Wroclaw delivered on them, but what I wasn't expecting was that my rather high expectations of this Polish city would not only be met, but considerably bettered. First off the domes. This was the world heritage site. I had been aware of the centennial hall for a long time, it was one of the buildings that stood out in my first encyclopaedia of architecture. I have to admit I have never really liked how it looks, but have a huge respect for the engineering that it entails. As I crawled closer through Wroclaw's traffic I noticed a lot of advertising and even more police on traffic patrol, and as I feared the hall was in use for an event on the day I chose to visit. As such it provided me with an answer to the age old travellers riddle, "What do you do when the men's volleyball world championships hinder your sightseeing?" Ans. "You go to the Japanese garden!" The enforced exploration of the surrounds of the hall was actually rather pleasant, the fountains were performing, the covered walkway was looking at it's renewed best and the Japanese garden was a welcome surprise. I did get to see inside, a friendly guard moved aside and gave me a good view of the interior as Russia beat Finland in what I am sure was a crucial match!?! I got caught up in the rush to leave after that match and to be honest I could have been leavening any large scale sporting arena, which I guess is a massive testament to the value of this building 100 years after it's completion. Next up the gnomes. If you have visited in the last 10 years you are likely to have seen these little statues all over town. They actually started as a tribute to the absurdist protest again the communist authorities in the city, protestors dressed as gnomes so when they were arrested the police looked ridiculous. This appeals to me on so many levels that I was even willing to overlook the commercialisation of this protest, it is something that really should be promoted, and the little statues are a lasting reminder. At the end of it all I am more perplexed by why Wroclaw isn't regarded more highly. This is the sort of city I travel for, and the sort of city that makes me love Europe. So I didn't see the best of the WHS, but I did explore more of the surrounds than I thought I would, but also it really goes to show that it is an impressive piece of undertaking, 100 years after its construction it is still playing host to large scale international events, if ever there was a case for outstanding universal value for this type of building this was it. But additional to that I really couldn't recommend Wroclaw more, to my mind it is an almost perfect European city for an urban traveller. Wroclaw is really one of the most beautiful towns in Central Europe, and the Old Town very much resembles Krakow and Prague - although on a smaller scale, of course, with fewer tourists. Built to commemorate the 100th anniversary of the Battle of Leipzig (hence the German name "Jahrhunderthalle"), the Centennial Hall is quite far away from the centre (I took a taxi to get there and walked back), but is located in a nice, green area near the zoo. There is a small entrance fee to pay, and you can see an exhibition on its construction (interestingly, it was the building whose dome finally surpassed the Pantheon's in diameter), then you are free to walk around the entire building. I was not overly impressed (well, it's a "landmark of reinforced concrete architecture"), but it does make for a pleasant outing in a very nice city, so there is not much to complain about. Today the hall is used for many different purposes, including concerts and even hosting some games in this year's Volleyball European Championships. I travelled to the Zoo stop by tram #2 from Wroclaw Glowny station. The Centennial Hall is just accross the road from the zoo. Because I reached the site early I toured the grounds first, using the pergola walkways and footpaths to reach the musical fountain, the Japanese Garden and the little wooden church of St John of Nepomuk. By then the Hall was open for visits. I climbed up to a vantage point in the tiered seating to admire this amazing structure. Considering that the reinforced concrete columns and beams were all cast in situ using simple wooden formwork, the finish achieved is fantastic. In its day it would have been a significant achievement. Sometimes you ask yourself what can really become a World Heritage Site? I certainly asked myself this question when I first laid my eyes on the Centennial Hall in Wroclaw - a huge grey concrete building that does not exactly place itself on the top-ten list of most beautiful buildings of the world. But as always, when it comes to World Heritage Sites, there is an interesting story to be told; named Jahrhunderthalle in German it was designed by the famous architect Max Berg in 1913. At the time of construction it was the largest reinforced concrete structure in the world and certainly a pioneering work of modern engineering and architecture. My local guide told me that at the time of construction, some of the workers was even afraid to enter the site because they thought that the whole structure would collapse. But almost 100 years later it still stands strong and has survived to major wars and seen everything from large scale nazi- rallies to large sports events as well as concerts with many famous artists, from Marlene Dietrich and Paul Anka. Hitler was here: "On September 12, 1930 Hitler held a speech in the Jahrhunderthalle for 25.000 people. In the period before the elections of March 13, 1932 (on March 3) Hitler was in Breslau again for a speech in the Jahrhunderthalle. In that same year he spoke at this location again on April 18 and October 19. In 1933, on March 1, Hitler spoke at the Jahrhunderthalle again. On March 22, 1936 Hitler spoke at the Jahrhunderthalle again. On November 20, 1943 Hitler spoke here for the last time." 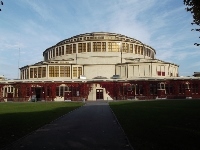 Name changes: "Centennial Hall in Wroclaw" was originally nominated as "Centennial Hall in Wroclaw (Poland)" but in its evaluation ICOMOS recommended a name change!